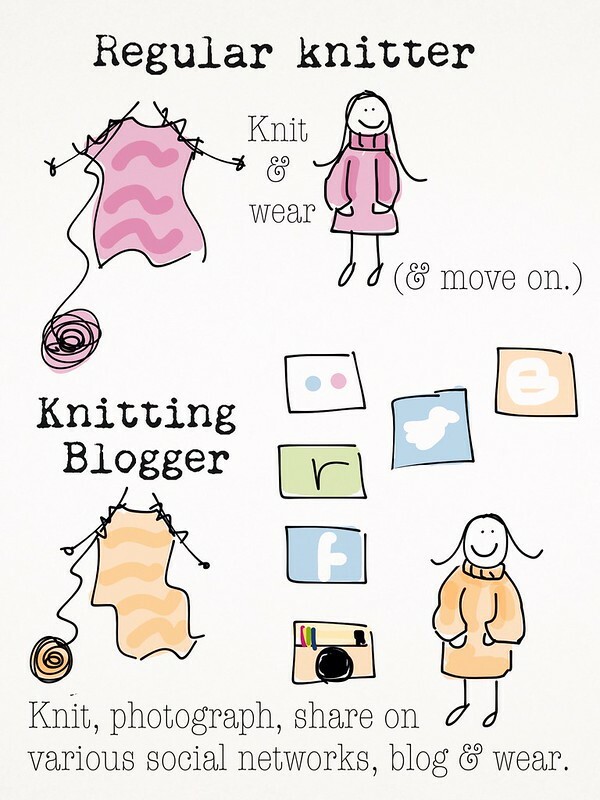 After recently publishing an infographic about secret stashes, and another about my own knitting evolution, today's Knitting & Crochet Blog Week prompt did not seem entirely out of the ordinary. As is often the case with my doodles, inspiration for this came from my Mum who is a "regular knitter" and often looks at me like I'm completely mad. If you're visiting from KCBW, I'm sure you'll understand. If you're a regular Wednesday visitor looking for my WIPs and books update, you can find a summary of current projects on Monday's post. This coming Friday I'll be hosting the Crochet at Play book tour, and will have an interview with author and designer Kat Goldin, which I'm sure you won't want to miss. Next Wednesday I'll be reviewing The Great British Sewing Bee book and the Amy Herzog Class "Knit to Flatter" (which I'm half way through and absolutely loving) so stay tuned! love it! It is exactly like my children who bring me their food to photograph as well!! I think I have been blogging too long! Sounds familiar - you have the most fantastic website so by the way! I love this infographic and can totally associate with it. I could probably add a part for the kids too as they whip up videos, podcats and prezi (app) presentations within minutes and share in synchronous learning environments. I am starting to feel old! Brilliant infographic Sarah ... hope it's okay to share a link to this post on facebook! This is so true, I love it. LOVE your wee pictures too, so cute! This is such a great infograph...and so true for today! awesome job! Love the infograph, beautiful artistry. Sounds about right ;) Love your doodles! Love it. I've morphed from 1. to 2. it would seem. Thankfully, my FO's are more tweet worthy than they used to be!! Yes, as others are saying, this is so true! I'm always sad when I am wearing or using stuff I haven't recorded somehow on at least one form of social media! This totally made me laugh, the older generation must definitely think we are all mad getting excited about our projects and taking lots of photographs of them etc :) I love this doodle. We, bloggers, luv to show and tell yeah? I love your doodles. They make simplicity look so cute and are so fun. I'll be interested in reading your review on the Knit to Flatter. And you're not allowed to wear it until you've blogged about it. Love the doodles! They are quite on point. Love the graphic! So true! I love seeing your ipad doodles! They turn out so cute-- and this one is so accurate!!! You're so right! Sometimes my relatives look at me like I'm crazy for posting all my crocheting but I think it's part of the fun: share to the world my projects.